As many of you know, one of the semi-recurring features on the weekend Uni Watch entries is a fabulous section called “Colorize This!,” which features readers (artists, really) who painstakingly and often in excruciating detail, colorize black and white photographs. Sometimes the photographs are of more recent vintage, and the colors are well known. Other times, however, a reader will find a photograph he wishes to colorize for which very little is known — not just the colors, but the story behind the photo. Many baseball related postcards from the early twentieth century preserve the history of the amateur and semipro teams prevalent across the country during this time period. Baseball during this era was unquestionably the national pastime with seemingly every community, irrespective of size, represented by a team. There was obviously strong interest in these teams and their more notable players; significant enough for photographers and publishers across the country to market images of these relatively obscure teams and players as postcards. Some of these vintage postcards survived the past hundred years as valued collectibles. Despite their small size and sometimes poor condition they are great candidates for colorization. I recently discovered this amusing postcard copy of the World’s Largest Baseball Player (below) dating from 1908. The monstrous 450 pound player in the photo played for the Citizens Ball Club of Emporium, Pa., a community in north central Pennsylvania with a population at the turn of last century of only a few thousand. Interestingly, today it still remains a community of only a few thousand. It seems implausible, or certainly unexpected, that a person from this era would have reached 450 pounds and yet actively participated in a sport that requires some agility. A hundred years ago there were no fast food restaurants, super markets stocked with cheap snack foods, video games to keep you cemented to a sofa all day, or other potential contributors to today’s obesity epidemic. I wonder if any of his Citzens Ball Club teammates were similarly large stock as the note on the back of postcard suggests. Was this level of obesity common a hundred years ago? Further research turned up almost nothing about the unnamed player or his team. For the colorization the choice of uni colors was mine based on tonal range guesses from the original. The research did, however, provide information to suggest he may not have been the World’s Largest Baseball player at all. In fact there was a whole team of players with a roster that tipped the scales a few pounds short of two tons! This unusual traveling group of players was known as the Fat Men’s Amusement Co. Ball Team from Waterloo, Iowa. The Two Ton Team toured cities throughout the Midwest during the summer of 1910. The 3″x5″ postcard original used for the colorization (as I learn more about these early twentieth century collectibles) is categorized as a “Real Photo” postcard, which is a term describing postcards created by exposing a negative directly onto photographic paper. So the post card was an actual B&W photo print. I also discovered it wasn’t until early 1907 that you were permitted to write anything on the back of the post card other than the mailing address! This may explain why many of these postcards have handwritten descriptions on the image. Unfortunately this postcard has no writing on the back to indicate the location or date of the photo, but almost certainly it was taken during the 1910 tour. The spectators, formal but norm for the day, attire form an interesting part of image and a colorization challege. For the colorized image I was fortunate to find this short video clip (shown below) that contains an actual uni jersey and discusses the players and team background. The person being interviewed is actually the granddaughter of the youngest player on the team (Earl Holm, first player on the left in the image). Before watching clip, see if you can guess which the players in the image is actually the umpire; his identity is disclosed in the interview. “Waterloo has one of the most unique amusement enterprises ever organized in this part of the country is to be called the Fat Men’s Bell Team and Amusement company. Frank C. Knee who weighs 450 pounds is to be the manager and Oliver Kimball of Chicago, who is 48 inches tall, is to be the umpire. He is the smallest umpire in the world just as Baby Bliss of Bloomington, Illinois, who is to be the catcher, is the largest man in the world. He weighs 640 pounds. The other members of the nine are Earl Holm, who is 15 years old and weighs 350 pounds being the largest boy in the world; Wolfgang Schmidt of Nebraska, 426 pounds; E. J. Sheehan of Clermont, Iowa, 390 pounds; M. V. Hinds of Monmouth, Illinois, 400 pounds; Charles P. Van Luven of Osage, Iowa, 375 pounds; Finkey Howrey of Beaver Dam, Wisconsin, 325 pounds; and J. A. Brownell of Manchester, Iowa, 370 pounds. Not all sports writers were raving about the Fat Men’s traveling road show performance. A Milwaukee Sentinel newspaper article, dated 25 September 1910, termed them Baseball Travesties (far left column, half way down the paper). The article makes note of the lawsuit for back wages by Baby Bliss, the largest player on the team and highlighted in the video clip above. I wasn’t able to determine positively if Baby Bliss is present in the colorized team photo, but he might be the large fellow on the far right. Undoubtedly he was the featured attraction of the Fat Men’s midwest tour that summer. Leonard H. “Baby” Bliss, “world’s largest man,” bicycle showman, and baseball wonder died tragically just fifteen months later as described in this obituary. Final note, if you find this baseball era interesting check out this link to the full reprint of Spalding’s Chicago Amateur Baseball Annual and Inter-City Baseball Association Yearbook, 1905. It includes the complete Rules of Baseball and Henry Chadwick’s (The Father of Baseball) Advice to Amateurs. Thanks, Gary. Tremendous, tremendous job, as always. An interesting note about that article Gary included with his interview — I don’t know if any of you read below the highlighted section, but there is a sub-hed entitled “Grave Charges” which alludes to Hal Chase throwing games(!) — you can read more on that here. Fascinating stuff…all right there in black and white. On Thursday evening, the Washington Football Club unveiled their alternate uniform for 2012, which Paul covered a bit yesterday. As he mentioned, and as seen on the obligatory Nike photo mocks, it’s pretty tidy — Paul called it “fine, if unremarkable,” and I would tend to agree with those assessments. Much attention was focused on the helmet, which is the best attempt (so far) to recreate a leather look that was the norm back then. At the time Paul posted yesterday’s article, he wasn’t sure who was responsible for the helmet design. UW stalwart, and super-sleuth Chance Michaels believed it’s done by Hydro Graphics Inc. (www.hydrographicsinc.com), who are “Nike’s go-to supplier for custom finishes” according to Chance. (As many of you know, I’m not a helmet guy, so this was news to me.) Nice work. He was right — you can see more pics of the helmet here, here, and close-ups here, here and here. My only complaint is that they went with a black mask instead of a gray one. You can learn more about the process here — and you can thank (or blame) them for the Ducks Rose Bowl helmets and Notre Dame’s golden dome lids too. Redskins owner Dan Snyder and his staff worked closely with Nike to create a look that spoke to the club’s unique heritage, while highlighting several key details that helped define the team’s history. The alternate anniversary uniform is a balance between history and tradition, featuring a rich darker color palate and updated numbering system. It is a modern interpretation of those worn back in 1937 ”” a year signifying the team’s move from Boston to Washington, D.C., as well as their first national championship. The patch on the shoulder is one that was worn in early team history. 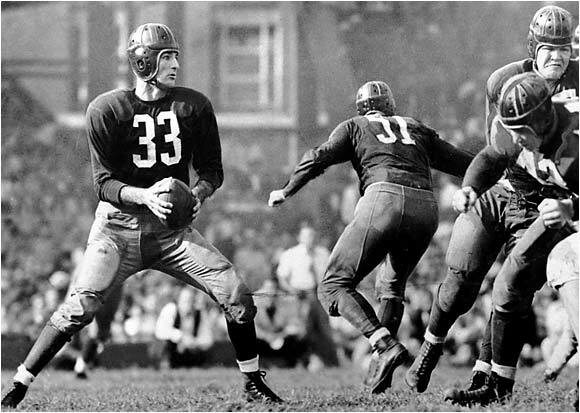 The design also pays tribute to 1937 QB Slingin Sammy Baugh, who in his first year in the league led the newly relocated Redskins to their first national championship. So — how’d they do? Well, color photography of that era is almost non-existent, so we need to rely on historical artifacts for the colors, but we do have black and white photographs from 1937, as well as photographs of the 1937 team. 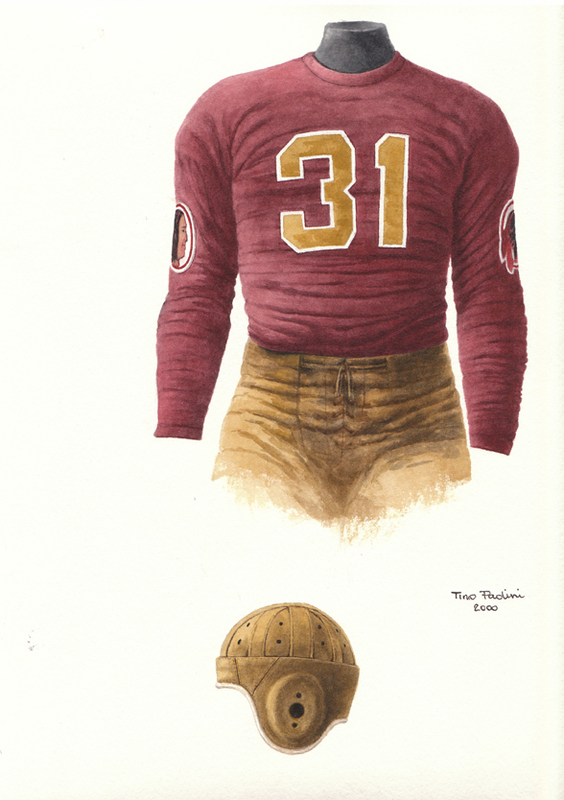 We also have this lithograph of the 1937 uniform. Based on those, I’d say the team has fairly replicated the 1937 uniform. 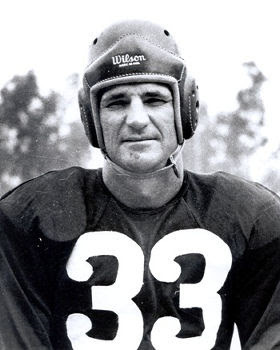 It’s a tricky era to be sure, as 1937 was the great Sammy Baugh’s rookie season, but numerous images of Baugh exist with him wearing several different uniforms during the leatherhead era, including this color(ized?) photo. 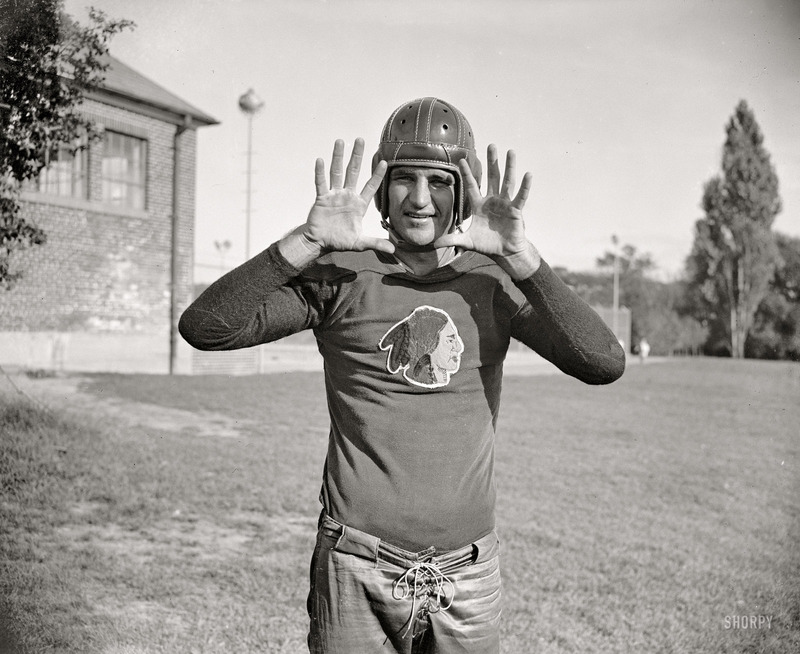 While this Shorpy image is dated September 1937, I don’t believe the club ever wore that in Washington (which the Gridiron Uniform Database confirms). But enough evidence is there to suggest that the uniform to which the team is “harking” back is very close to the one worn in Baugh’s rookie campaign, which was also the year the club moved from Boston to Washington. I’m pretty happy with the fauxback, which seemed to get all the details, right down to the sleeve patch, correct within the constraints of a modern uniform template. And while I’m still not a fan of the current team keeping their name, I am absolutely pleased they did not remove the sleeve patch which was clearly a part of the ’37 unis. Regardless of whether you agree with me that the current monicker is racist, and their iconography is offensive, I would in no way support them removing it in this instance. It’s part of the historical record, and if we are to accurately recreate the past, we cannot remove images that may be offensive in the name of political correctness. 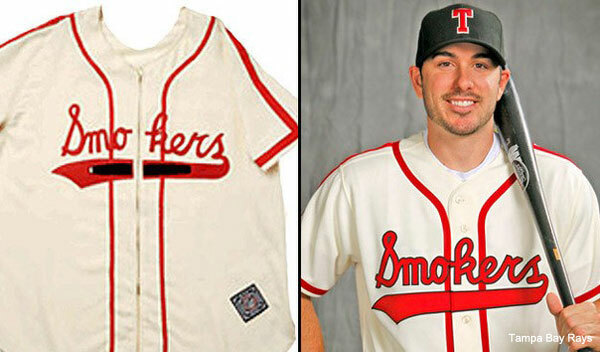 It was wrong for the Tampa Rays to remove the cigar from their Smokers’ throwbacks, just as it would have been wrong for the Astros to have removed the revolver from their Colt .45 throwbacks. For accuracy’s sake, I’m pleased the Washington team kept the patch. Verdict? I like them (at least from what I’ve seen so far) — obviously we’ll all need to see them in action before a final verdict can be rendered. But they seem to have done a pretty decent job in recreating an historical uniform (sorry, JTH), and I’m real interested to see how that faux leather helmet looks on the field. Lets hope at least one (if not both) of the games when they’re worn will be nationally televised. One last thought, and this was mentioned briefly in yesterday’s comments — if you think you’ve seen this fauxback before, well, that’s kind of because you have. In 1994, during the NFL’s 75th Anniversary, the Washington club wore a similar uniform to the one introduced Thursday evening. In that incarnation, it appears the sleeve patch was slightly different from the one which will be worn this year. Also, in 1994, the team simply stripped the decal off the helmet, keeping the gold facemasks, and wearing an old gold (matching the interior number color) for the pants. This time around they appear to have default tan-ish pants and they’ve certainly created a brand new helmet. What if Carolina had kept “Whalers” when they moved out of Hartford? Since I have been following the renaming process of the soon to be no longer New Orleans Hornets, I thought I’d use my spare time during my final senior semester to create a template for the current fan favorite, the New Orleans Knights. I used the Saints Black and Gold color scheme and also included the fleur-de-lis that has made New Orleans and the Saints recognizable worldwide. Back with some more tweaks. For part one I have the Clippers, San Francisco Giants, San Jose Sharks, and the Miami Marlins. Clippers: I added a blue alternate. I think the Clippers should use blue more often. Giants pt. 1: To be honest, I LOVE the Giants uniforms, but it drives me crazy that they ditched the primary road from last year and put a headspoon on it. But I do love the new alternate. So I for one do think the Giants should stay where they are (except for the primary headspoon roadie) when it comes to uniforms, but I went a little Oakland A’s kinda style with the uniforms. Home: Everything is the same, except they will always wear the orange billed cap at home. Home Alt: This is where I went with the A’s style. I took the Giant’s alternate road jersey and made it for orange fridays at AT&T. Road: Stuck with the design from last year. Road Alt: Same as the home alt, except with the gray pants and black billed cap, for Friday games. Roads: The alternate that the Giants have now is great, so I made it be the primary and I ditched the primary roads that they have now. Sharks: All I did here was change the home stripes on the jersey, since it normally goes White Orange Black, I changed it to Black Orange White, and I think it looks a lot better. Everything else is the same. Marlins: I find the Marlins new designs great. But one thing that bugs me is the white lettering on the road. So I made it black. Thanks and I will have Part two finished soon! That’s it for this round. Back with more tomorrow. That’s all for this fine Saturday, folks. Everyone have a good day. Love the idea of calling unis like the new Skins duds “harkbacks” when they’re recreating a general look-and-feel of an era rather than throwing back to any single actual year and uni. Since it’s a harkback, I’d have been fine with leaving the patch off. But I actually prefer the harkback patch to the current team logo. Always bothered me that the Redskins use the severed head of an Indian as their logo. Dude needs some shoulders! Shoulders, and a single tear running down his cheek. Although philosophers will need to debate the precise lines between a harkback and a fauxback. A fauxback is when a team attempts to replicate a specific year and gets a bunch of details wrong. A harkback is what we’d also commonly call a “retro” uniform, where the idea is to mimic an old design, but where accuracy is not truly important. A throwback is when a team goes for a specific year and are as close to accurate as possible. Right, so the Astros in shooting star unis is a throwback; in Colts uni without revolver, fauxback. Yankees wearing normal uni vs any team in throwbacks is a harkback. Give me a an actual throwback uniform any day. I hate when the media calls fauxbacks throwbacks as they do all the time. What would the 2011 Pittsburgh Penguins Winter Classic unis be then? I was always under the impression that a Fauxback was a fake throwback, as in it isn’t really throwing back to an actual uniform but rather a design and/or concept. We need to have a word for things like that, as more and more teams are doing composite throwbacks where elements from an era rather than a uniform from a single season are being used. So would we consider the Jets’ NY Titans getup (which I love even though no one else does) a harkback, since it incorporates the old gold numerals from ’60 with the shoulder and pants stripes from ’62? The Mets’ current home pinstripes are a harkback, since they are off-white instead of white and have numerals on the front. The road greys are a harkback to ’62 but a throwback to ’95. 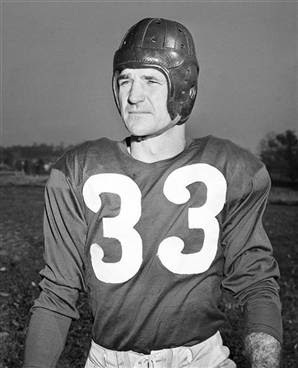 The NY Giants’ current uniform might also be considered a harkback, since the helmet has metallic paint finish and block numerals. That Carolina Whalers logo is pretty close to what the Connecticut Whale’s logo shoulda looked like. I would’ve preferred a square-shaped C with the internal negative space acting as the bottom/stem of the whale tail. I’m still baffled as to why the Whale decided to base their logo off the Springfield Indians. Yeah you’re right! I never noticed that before! The Whale’s logo TOTALLY looks like a mash-up of the Hartford Whalers and Springfield Indians logos. Maybe they did it to also attract fans from Springfield? And/or it’s possible the Indians and Whale logos were designed by the same graphic designer. And/or someone in the Whale organization was part of the Indians organization and wanted a reference to the Indians in the logo. I have a feeling it’s definitely more than a coincidence. Gary- Brilliant work. I wonder if the Fat Men’s Amusement Co. Ball Team from Waterloo, Iowa ever stole any bases? Excellent work, Gary, with a very interesting write up. I love that pic of “The World’s Largest Ball-player”. Thanks George and welcome back from Zakynthos. I remember that planet from an old Thunderbirds episode. All praise to the mighty Chanko! Superlative work, Gary. And yes, Scott, those 2007 faux-Grays are sublime. Off-subject for a second: if Paul or somebody else addressed this earlier, I apologize, but I have an issue with the new truncated posts/”continue reading” prompt that appear on the home page. I get doing that for archived posts, but it’s incredibly annoying to have to do it for that day’s post. I can’t think of another website that’s set up this way. Just wondering what the rationale behind this move was. Thanks. I was going to ask about the reason for doing this now. I noticed it this past few days but did not read all comments. Great colorization Gary…and even better research! 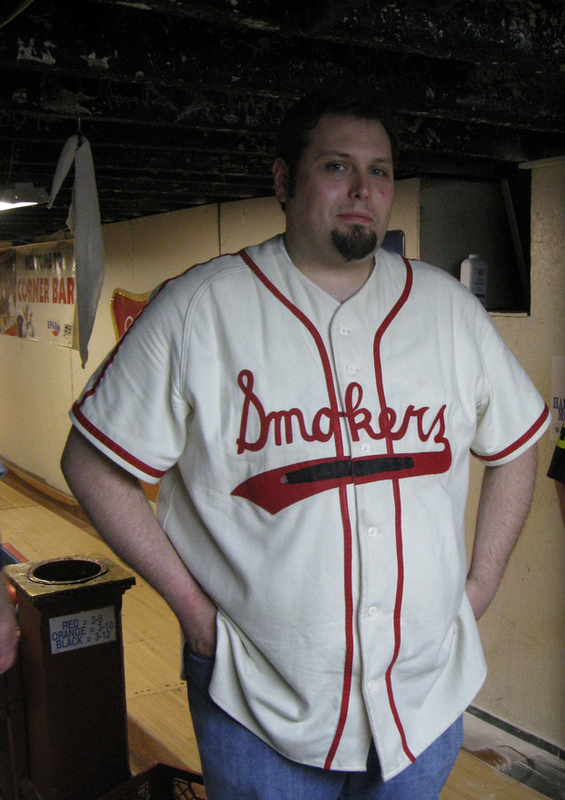 Ironically, I posted the original photo to my blog last week here: http://therealbsmile.tumblr.com/post/22318554769/1910-fat-mens-amusement-baseball-team-back-in. Looks like we peruse some of the same auction sites. Top drawer stuff today, Gary. Great job. And a thought-provoking Benchies, too. Come forward, Mick…you *can* handle the truth! Redskins is a football team. Was it ever used in the football context in a negative or demeaning way? You mean other than by Cowboys/Eagles/Giants fans, right? The problem (for those who have a problem)is the association to the Native Americans via the logo. I suppose if they’d been the Redskins and never used a logo that developed beyond some sort of stylized W or R, they might be ok – Redskins could be like Red Sox. But obviously that isn’t the case. You mean American Indians, right? :) Which also, I guess, has become an offensive term (even though Associated Press still says it is the correct term to use). Gary, Great work and info. I skimmed most of the column today. So I was wondering who the fat guys team played? I will read more of the background on the team. They are something I never heard of until today. So some enjoyment looking at your colorizations and some education as well. They apparently played semi-pro and amateur teams from cities and towns throughout the midwest. These touring or traveling teams were common during this time period. I wonder how they did as a team? Man, against that team, “hit it where they ain’t” would have been good for an inside-the-park homer every time! Gary, I just watched the PBS clip. Fascinating story. I do like the Redskins look and really like the leather look to the helmet. I wondered yesterday how the helmets would look from far off. But this is a nice try to simulate a leather helmet. Those Hydro Graphic helmets are amazing. Gosh, I wish the Pack wore those with their throwbacks the past few years. 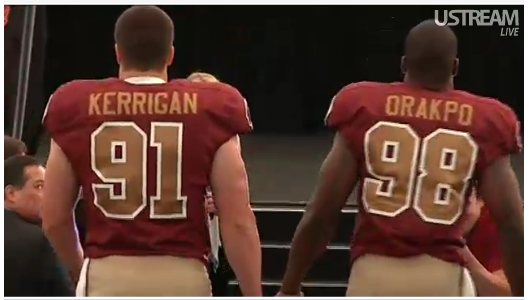 I think the Redskin’s uniforms are amazing. I am not a “jersey guy” but if I had an extra $120, and I was a Redskins fan, I would but one in a hot second. The attempt of modernizing an old uniform with its current template was REALLY well done in my opinion. Hate those white enamel white straps. Couldn’t they have gone with a leather-like tan? Nope. NFL rules state that chinstraps must be white. I suspect that the Packers will adopt the leather-ish look if and when the throwback blues make another appearance. They’re not wearing them in 2012, so we’ll have to wait to see. The uniforms are outstanding, of course, but what I really appreciate about your colorisations is the attention given to the small details: the subtle variations in wood grain, shadows across the sun dried dirt, the skin tones of people in the grandstand, the ties and hats and dresses, the soft green of the trees. Any updates on the Benchies T shirt? I’ve heard the expression “not a helmet guy” on this site more than once. I’m not sure what that means. Helmets are often discussed, and they are a huge design component of football and baseball uniforms. Aren’t we all helmet guys? I don’t know much about the manufacturing of helmets, but I do know that I hate the Revolution, Revo Speed, and the Cool Flo. Am I a helmet guy? If you care about specific helmet models, you’re a helmet guy. No disrespect to the people who do differentiate, but to me, a helmet’s a helmet. This is true for many pieces of equipment, up to and including shoes. These differences are part of what makes the uni-verse so interesting. I hate ugly shoes, too. I am a helmet guy. I wonder why the new designs have to have the indentations and grooves or whatever. Can they not just fill those in to have the classic solid look we had for decades. What Phil said. This is a nice look. Now I’m off to go tie an orange ribbon ’round the old oak tree. Rangers-Angels 1974 throwback is glorious today. I miss those Rangers sleeve stripes. I miss them even more on the Orioles. Some team…not every team, but some team…needs to bring back that look full-time. Sans sansabelt and I would fully agree. I never liked waist stripes with buttons. Pullovers, maybe. I liked the striped sansabelts, too, but I’m not married to them. I could easily live with belted pants and striped sleeves. LOVE the Rangers look. But I am totally doudting how the name and # looks on the back. Typeface and font I bet are wrong. PL? I think I wasn’t seeing as much blue trim around the #’s. Not only is Ian Kinsler going with stirrups, he also went throwback on his shoes. Plain black and white low cut Nikes with white laces. Incredible. Kudos to Gary for the great post. This is easily one of my favorite UW posts. Love the history lesson that developed through the colorizations. Very Erving/Bird-ish, which is very I’d Wear That.